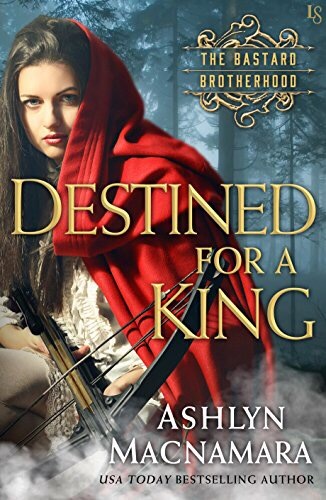 Destined for a King is a historical romance combined with an earthy mythology reminiscent of an Arthurian tale. Calista Thorne, the daughter of Blackbriar Keep, has been told her whole life that her destiny is to be married to a king, and in fact she is promised to one. When Blackbriar Keep is set upon by a band of warriors intent on taking over, she picks up a bow and arrow and unbeknownst to her, shoots their leader, Torch, with a poisoned arrow. When he comes down with a mysterious illness, she must heal him, or her father will be killed. Ashlyn Macnamara’s style of writing brings depth to what could have been a simple story. I have read many historical romances with the same simple theme. Calista destined to wed a king, and Torch, told that he is the true king by his mother, is enriched with a magical, almost spiritual element that enhances the story. They had a healthy chemistry, which was good reading, but what drew me in was the mythology. Is he or isn’t he the true king? Will those visions come true? What is with the mysterious monk and his order? These questions will be answered, but this is only the first in the series, and I’ll have to keep reading to find out the answer to those questions. However, the romance is solid, and I liked these characters, so I look forward to seeing what their future holds. I was given a copy of this book by the publisher, Random House Publishing Group, through NetGalley, for my honest review.